September was a crazy-dazy month with not one, not two, but three of out town trips. 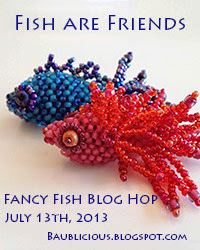 These included a visit to family in Southern Oregon, the bead retreat where I made Dali, and finished up with a transatlantic cruise (more about that in an upcoming post). With all of this travel, I've had a great deal of incentive lately to rethink the way I travel with beads. One of my 'problems' is while I think I know what I want to work on, my ideas often change as I get into a project. 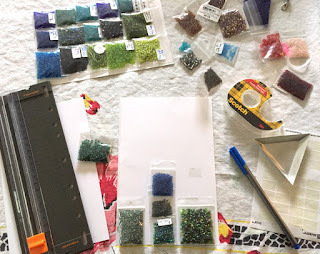 It's so frustrating when I know I have the perfect beads for the piece I'm working on; in my studio a hundred (or a thousand) miles away back home. The obvious solution is to bring LOTS of different types of beads, right? Except for the little problem that beads get heavy fast! This might not be a problem if you're traveling by car. But we were planning a two-week trip for two with minimal luggage: two suitcases total (one carryon-size), plus backpacks. To make it a little more complex; I never know when I start whether the piece will later become a tutorial, or possibly even a kit. 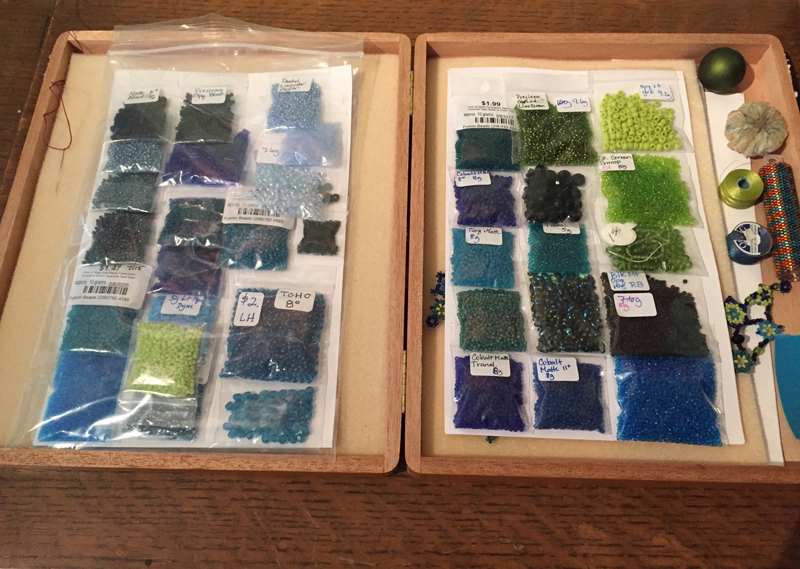 Just in case, I need to be able to figure out not only what beads I used, but how many of each. Oh, and I also wanted to be able to bead wherever I was, so I wanted to bring some sort of rigid beading tray as well as my bead mat. 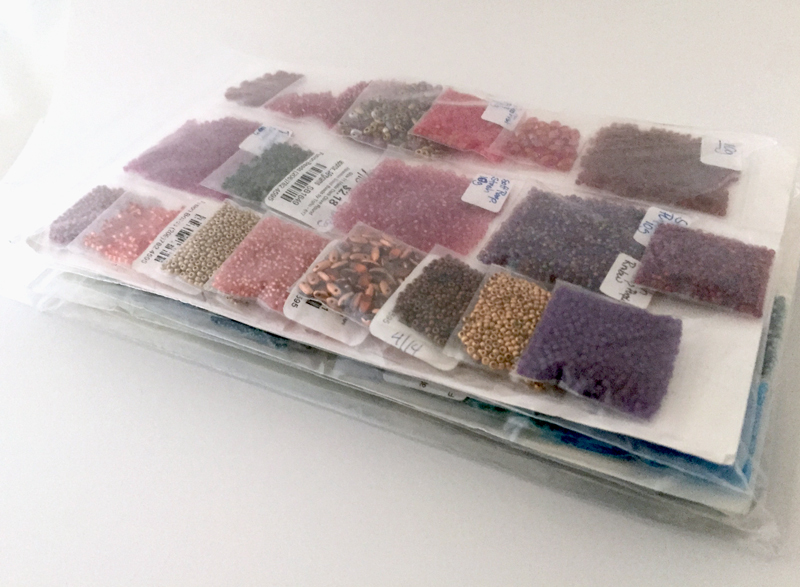 For bead storage, I decided to make up 'bead kits', using little plastic baggies for each bead type. The largest bags I used were 2x3"s. These larger bags I reserved for the sea glass which wouldn't fit safely into smaller bags. I wanted everything to lay as flat as possible to reduce the chances of breakage in transport. Most of the baggies were 1 1/2" x 2". 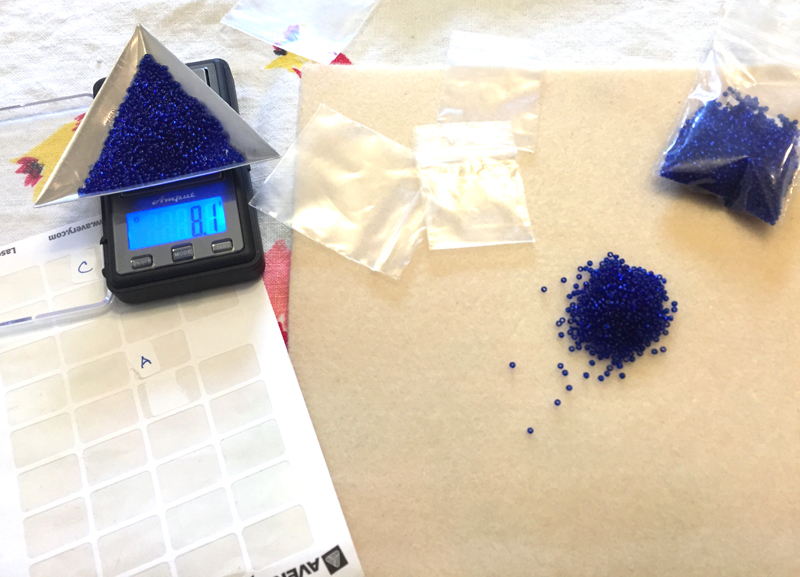 Using my little scale I measured out my seed beads; 5-12grams each for most of my size 11s and 8s, about half that for 15s. Then labeled each of the baggies with bead types and weight. This way, when I returned, I could re-weigh any beads I used and simple subtraction would give me amounts used! 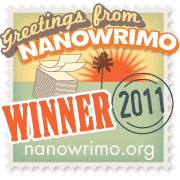 This took me the better part of an afternoon, but it went fast, especially as I spent the time listening to an audiobook. But lots of little baggies are hard to track; they can get lost and it can feel like searching through a needle in a haystack to find anything. The next step was to find a way to organize and store the beads so I could quickly see everything. For this, I used half-sheets of heavy cardstock and double-sided tape. Working up from the bottom of each sheet, I arranged the baggies in color families. The finished 'kits' it incredibly easy to see everything. And they look pretty too! Best yet, I've found if you stick the tape to the paper first and press it down well, it makes it easier to remove and return the baggies, and the tape will continue to hold them securely in place through several repeats. That just left the question of what to do for my beading surface. 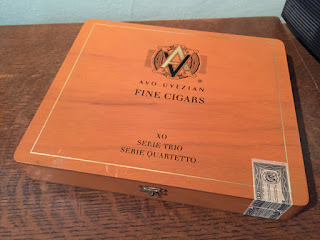 The solution here was much simpler - a beautiful cigar box a friend had gifted to me. Made from an extremely light-weight wood, the box is quite slim, less than two inches tall. Opened, both sides lay almost flat. I cut Vellux beading mats to fit both the lid and the bottom. I prefer working out of the lid, as the lip is not as deep. 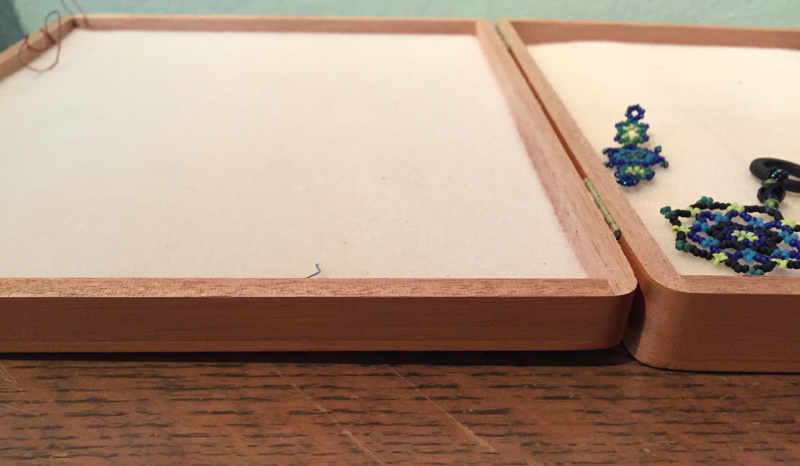 The box holds all of my beading tools, and two-three of my beading kits or finished pieces. 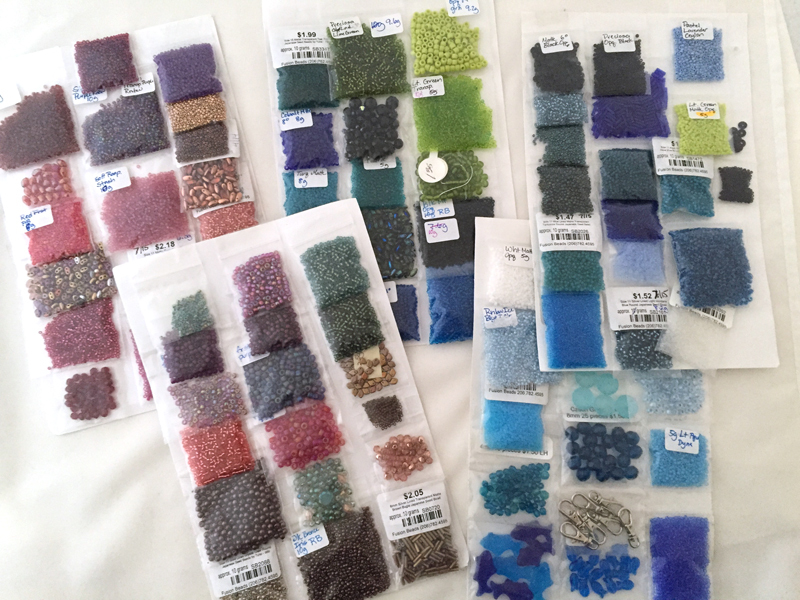 Every time I travel, it seems I try different storage solutions, looking for the 'best' way to carry the widest variety of beads. I've been working through iterations of my current system for the past year; so far it seems to be working pretty well. 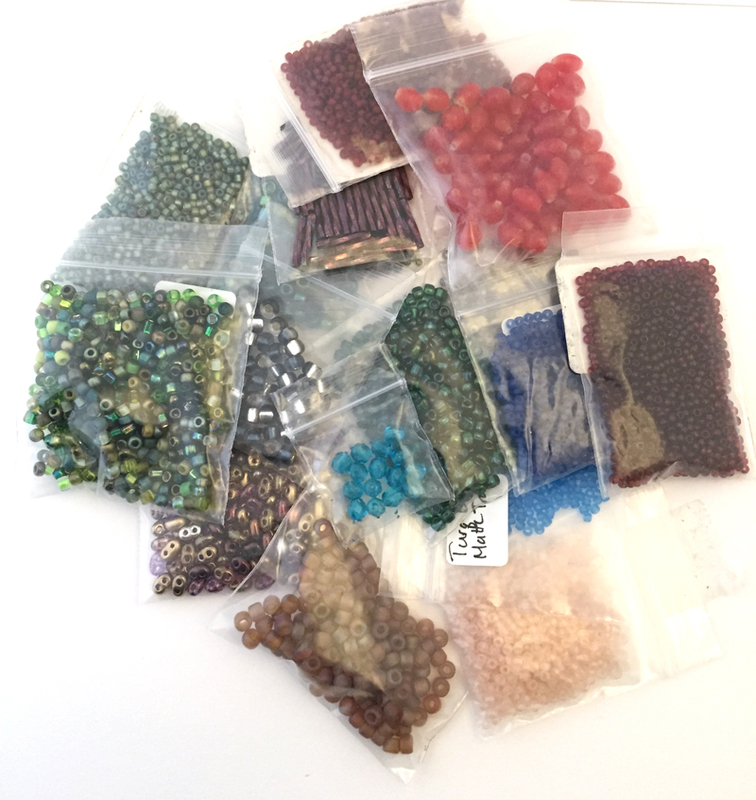 On this latest trip, I brought eighty-nine baggies filled with different types of beads and findings organized into five 'kits'. The whole kaboodle (five kits, bead box and beading tools) weighed in at just under 2lb, 6oz (just over a kilogram). Not too bad! So that's my current solution. 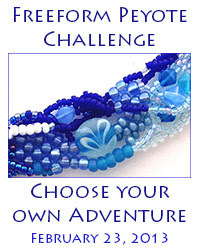 What are your favorite ways to travel lightly with beads? I can't say any of my travel solutions have been as elegant! I do store my smaller beads in little bags like you did, however I tend to dump all my little baggies into one big Ziploc type bag per project. I also keep all of my most used tools in a small plastic storage box which has to come along, though this way I do wind up bringing tools I may not need for what I’m planning. Then of course I need to add my optivisor to the pile. I will wrap my optivisor in the vellux beading mats to protect the lenses and save some space, and the whole kit and kaboodle gets dumped into a canvas bag or small backpack. The bag winds up weighing at least 5 pounds I’m sure, probably more if I get carried away with project planning. I’ll have to give your ideas a try next time I need to pack light! My solution started out pretty much like yours Vala. But I'm continually trying to figure out how to pare down the weight in my travel bag. Without sacrificing options, of course! My shoulders get sooo tired carrying my heavy pack through airports, up hills and around dales. I love your idea, Karen! I wish I could say mine is that organized, but my solution is to stuff as many tubes as I can fit into a plastic bin... and then buy whatever I forgot at a bead store. I have needles at my mother in law's place, in case I forget again. Yep, I resemble that solution too! Except that I knew this time around there wouldn't be any beading stores nearby to supplement my stash. I really needed to pack everything I might need. Though I did find a fantastic rock store in southern Oregon. oh my how organized you are! I only take my beads with me if I'm driving, and then I tend to take waaaaaay too much with me. I will pack piles of things in shoulder bags, which makes for lots of hunting once I sit down to bead. I might need to give your approach a try. Not sure I'd be able to be so organized, but even a little bit would go a long way for me! 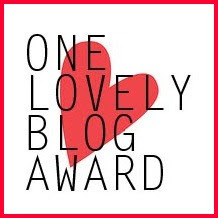 Ooh, I love this. 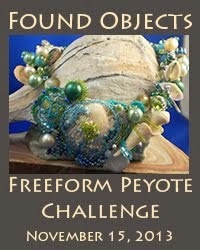 The best I've done is to put a few projects in photo boxes; beads, needle and thread, and any instructions. I put scissors, pliers, etc. in another photo box. Were I to do this logically, I'd include some simple projects with nice repetitive stitching, as well as a few requiring more concentration. The more basic items are nice to work on while visiting. My worst mistake was waiting until the last minute to grab some beads. I had a ton of beads, and not necessarily everything I needed. I know what you meant about 'conversation' projects. I often find myself making snowflakes if I'm chatting with people and beading.